It's another lovely day at Cambridge as I prepare for a cable launch in the SZD Junior, HEK. © Martin C. Gregorie 2002-2019. All rights reserved. 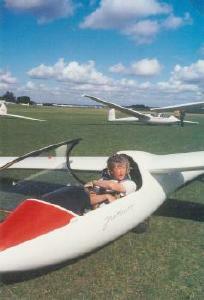 These stories have been written, not to display the author's big head, but in the hope that they might inspire others to take up the wonderful sport of gliding. Simply put: if I, in my mid fifties, could get from air experience flights to solo in under six months of weekend flying then you can do it too and have a lot of fun along the way. My club, the Cambridge Gliding Centre, is heavily oriented to cross country flying and this has provided me with a graduated set of objectives that has provided a hugely enjoyable way forward post solo. I keep hearing that new solo pilots in clubs without a cross country tradition can get discouraged: they have no clear idea about what to do post solo. If these pages provide pointers for even one of these pilots then so much the better for all of us. 100 km: what comes after Silver? A short ride in a Libelle. FLARM installation in a Standard Libelle. These are copies of the checklist that I use when planning a cross-country flight. They are updated as the links change or sites are replaced, so check back if you keep a local copy and a link stops working or its target looks different.